CHARLOTTETOWN, PE – The Gahan House, the brewpub branch of the PEI Brewing Company, has announced details of a new competition that will offer a local homebrewer the chance to have one of their recipes brewed as a feature beer for the pub. 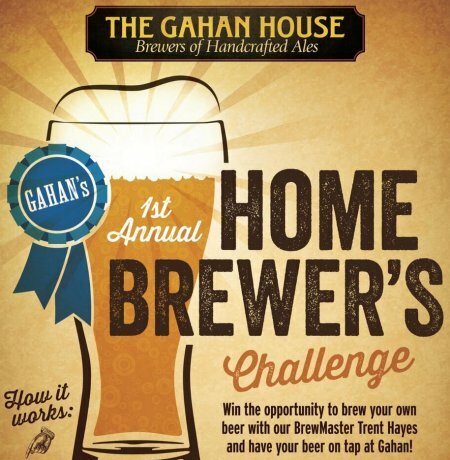 Gahan’s 1st Annual Home Brewer’s Challenge is open to all homebrewers in PEI who work with all-grain recipes (i.e. no extract or brewing kits). Those interested in entering can register by emailing gahan@murphyrestaurants.ca by February 21st, with a six pack of the entered beer due to be delivered to The Gahan House by March 21st. A panel of judges including Gahan House head brewer Trent Hayes and other beer experts will choose the top beer in late March, and the winning homebrewer will be invited to join Hayes to brew a full batch of their beer to be offered as a limited edition seasonal at the pub. For more details, contact the email address above, or visit Gahan House at 125 Sydney St. in Charlottetown.